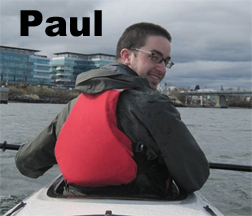 Paul has worked full-time in the store and and served as our lead instructor for our canoe, kayak, and SUP programs. He currently instructs part-time when not focused on maximizing his summer fun with his young family. He is a graduate of the Bachelor of Applied Ecotourism and Outdoor Leadership program at Mount Royal University and recently completed a Master of Education in Leadership Studies at the University of Victoria. From September thru April he is a lecturer/instructor at Mount Royal University. Paul has travelled widely in pursuit of outdoor fun. He led YMCA Camp Chief Hector’s Leadership programs for two summers and instructed at the National Outdoor Leadership School. Basically he’s just incredibly passionate about outdoor leadership, and paddling in particular.